Delicious, hot coffee is best in your mug, but spills can happen, even when you're careful. 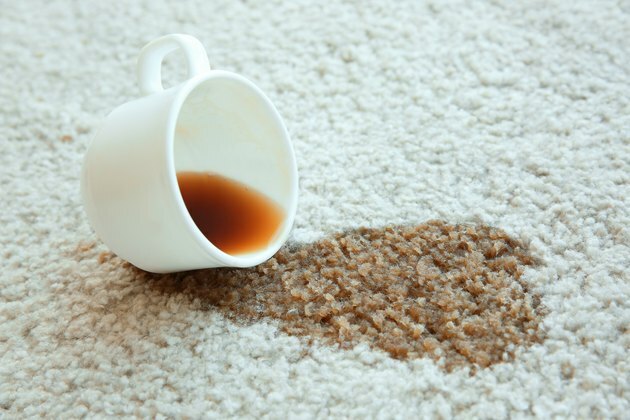 Stains are always easiest to remove when they're fresh, so a dried coffee spill on carpet may take a little extra work to remove. Grab some supplies from around the house to tackle the stain as soon as you notice it. Why is a dried coffee stain so difficult to tackle? Not only does it have time to set when it dries, but coffee also has tannins in it that are more difficult to remove. If you love your creamer or even just a splash of milk in your coffee, you add the protein of dairy into the mix, which is more difficult to remove. It's not impossible, though, if you know how to tackle the dried coffee stain on the carpet. For fresh coffee stains, the first step is to soak up as much of the liquid as possible by blotting. If it's already dry, you want to rewet the area with clean, warm water. The water can help release some of the dried coffee. Just like you would with a wet coffee stain, use a clean cloth to blot the wet area to pull up any loosened coffee. It's best to start at the outer edges and work toward the middle of the stain so you don't spread the coffee stain more. Continue wetting and dabbing the area with clean water to get as much of the stain out as possible. If water alone doesn't power through the dried stain, you'll need to add a cleaning product to the mix. You can use a commercial cleaner, but many household items are also effective on coffee stains. It's always a good idea to test the cleaner on a hidden area of carpet whether it's a commercial cleaner or homemade one to make sure it doesn't ruin the carpet. Dish soap, baking soda, white vinegar and hydrogen peroxide are all options for cleaning up the stain. A little mild detergent in warm water is a gentle option. Add a tablespoon of white vinegar to the mix for extra cleaning power. You can also dilute one part of vinegar with one part of water and spray onto the area to remove the stain. When using baking soda, mix one part with one part water to create a paste that you work into the stain, mist with water and blot up the excess. For a really stubborn stain, you can dab hydrogen peroxide onto the area. Will peroxide discolor carpet? It definitely can lighten the color of your carpet, so it's very important to test it on a discreet area first. When you have extra ingredients in your coffee, particularly cream or milk, you may need a little extra help to clean the stain. An enzyme laundry detergent should help break up the proteins in the stain. Mix the detergent with warm water and dip a cloth or sponge into the mixture. Dab it onto the stained area to loosen the coffee. Stubborn coffee stains may require you to repeat the cleaning process several times or to try different stain removal options. Once you get rid of all traces of the stain, you'll want to do a final rinse. This helps get rid of any detergent or other cleaning products you used. Use cool water when you're rinsing out the carpet. Grab a towel or clean cloth to dab up the water. Continue rinsing the area until you remove all of the cleaner. It's best to keep people off the area until it dries completely to avoid getting dirt and other stains on it.